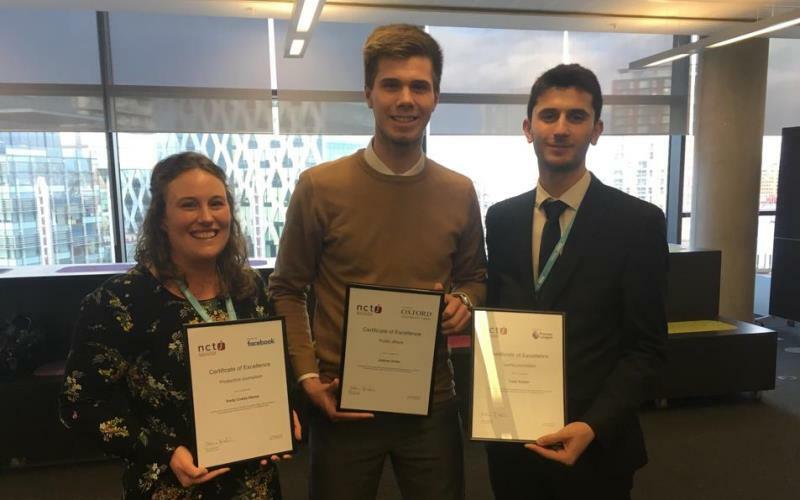 Four high-flying News Associates graduates were awarded for achieving the top exam results in the UK at the NCTJ diploma awards 2019. Join our award-winning team by studying on one of our fast-track, part-time or sports journalism courses – apply here. News Associates graduates dominated the awards presented to those who receive the highest marks in the NCTJ Diploma in Journalism exams during the 2017-18 academic year – with News Associates alumni across a variety of courses achieving the best grades in public affairs, sports journalism, shorthand and production journalism. Broadcaster and journalist Charlie Webster presented the awards – with all winners receiving a certificate and a £250 cheque – at the annual NCTJ Student Council meeting at the BBC in Media City on Friday, February 8. 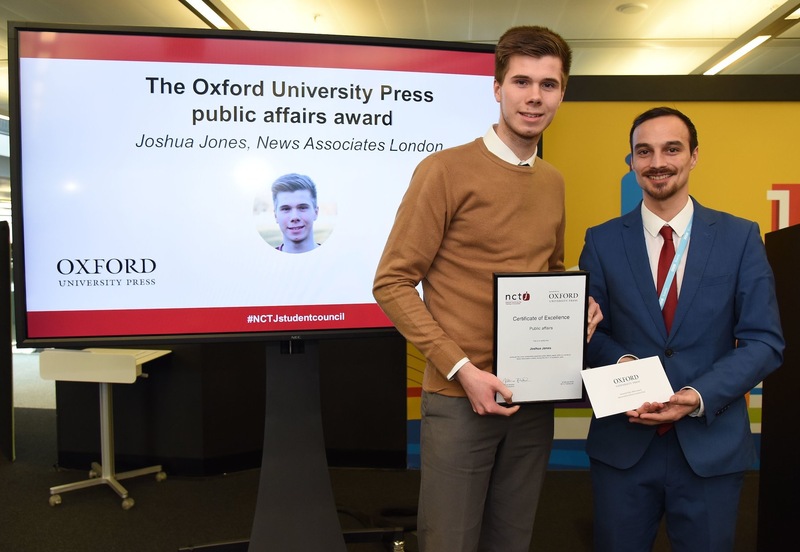 Sports journalism trainee Joshua Jones, who now works at Sun Sport, achieved an incredible 98% in public affairs – the third year in a row a News Associates trainee has won the prize. 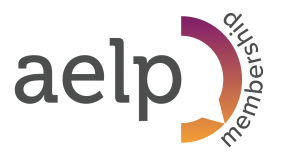 Click here to see how we did in 2017 and 2018. Joshua said: “Opting to go to News Associates was the best decision I could have made to begin my career in journalism. “The sports journalism course not only taught me how to write like a journalist but also what the industry actually entails. “I won’t pretend it was easy by any means but it was intense and, crucially, practical. “If it wasn’t for the contacts and links News Associates has, I would not have landed my job as a sports reporter at The Sun. 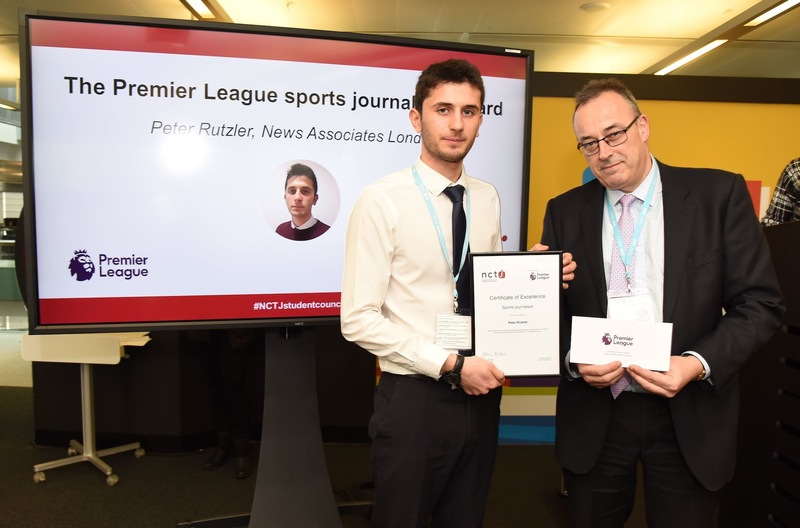 Fellow London sports journalism trainee Peter Rutzler, now at Mail Sport, scored 89% in his sports journalism exam – reiterating the fact that our sports journalism course is officially the number one NCTJ journalism course of any kind in the UK. Peter said: “I was shocked and thrilled to hear I’d won the Premier League prize. “The many hours honing my on-the-whistles and preparing for sports quizzes at News Associates has certainly paid off! “I don’t think I’d be here without the News Associates sports journalism course in London. “It put me in the best possible position to succeed – from the enthusiasm of the brilliant staff to just being in an environment where you are immersed in sport and its media output. Fast-track trainee turned Daily Mail reporter Dora Allday reached an impressive 120wpm in shorthand – after getting 100% accuracy in her 110wpm exam. Dora said: “I’m delighted to get the shorthand award. The News Associates team don’t stop once you get your 100wpm, they push you to work yourself harder and get the higher speeds because they know it’ll set you apart in a newsroom. “I use shorthand everyday – people say you don’t need it but why wouldn’t you learn such a valuable skill? 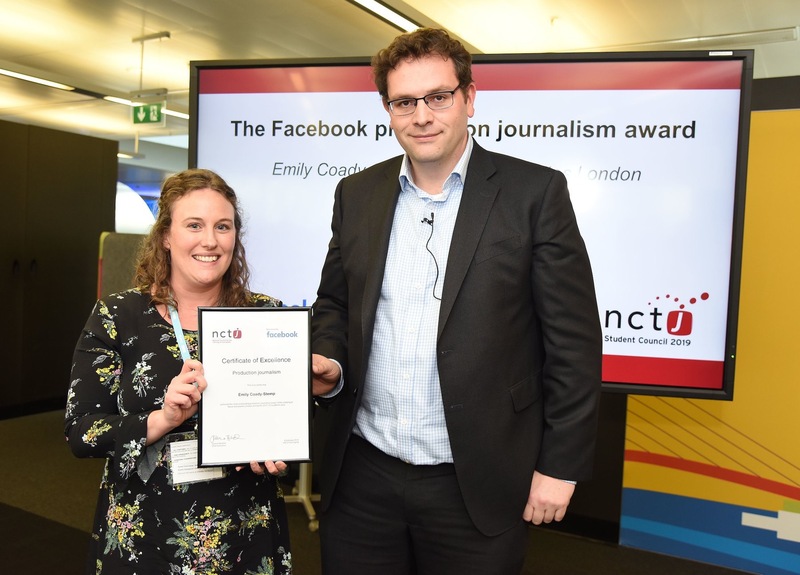 Emily Coady-Stemp, who studied on our part-time journalism course and is now the deputy editor of South West Londoner, achieved the best result in the UK in production journalism with a remarkable 78%. Emily said: “I was amazed to hear I’d won this award, and absolutely could not have imagined being here without the News Associates team. News Associates course director Rachel Bull said: “It’s always great to see the hard work of our News Associates graduates recognised by the NCTJ – especially across such a variety of subjects. “Their results are the reason we are the number one NCTJ course in the country and we couldn’t be more proud. Why study anywhere else? Click here to apply for one of our award-winning fast-track, part-time or sports journalism courses in London or Manchester. To get a glimpse into the journalism industry and our hands-on training come along to a free workshop – book here.